How to create an AI-powered Dialogflow web chat that looks great on mobile & desktop. To use Botcopy you must have a Google Dialogflow agent. You can build a custom one, or have us do it for you. Or, for a quick test, use a Dialogflow pre-built agent. 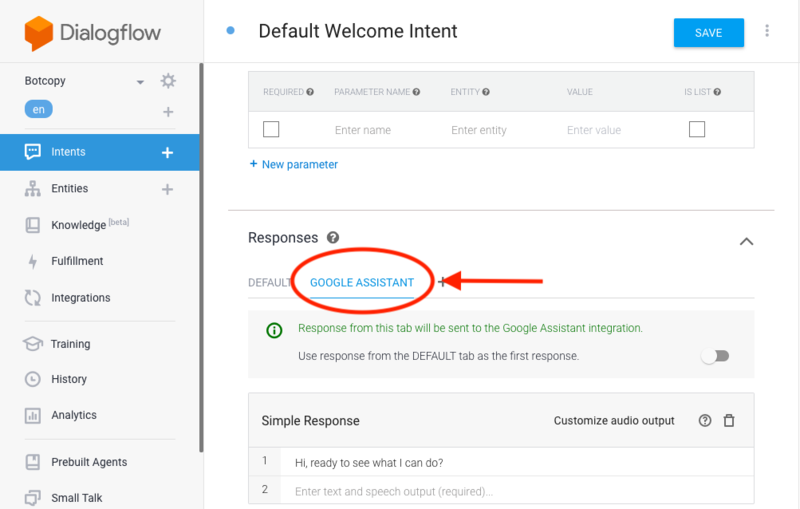 Regardless, your Dialogflow agent must be set up with Google Assistant response types. Keep in mind, your Dialogflow agent can also have responses set up for other channels, such as Messenger. But, to work with Botcopy and your web chat, your agent must include responses built in Google Assistant. For info on how to do this see our Docs page. If you still get stuck, reach out. Once your Botcopy account is set up, tap the big square button to add a bot and you're on your way. If you don't have a Dialogflow agent you can still look around and try our branding portal. We'll generate a random name for your bot. To change the name click on the bot, then find & click the Connect tab in the left sidebar. Within the Connect page you can name your bot. To use Botcopy you must have a Google Dialogflow agent. You can build a custom one, or have us do it for you. Or, for quicker results, use a Dialogflow pre-built agent. Regardless, your agent must be set up with Google Assistant response components to work with Botcopy. More info. Once your Botcopy account is set up, tap the big square button to add a bot. 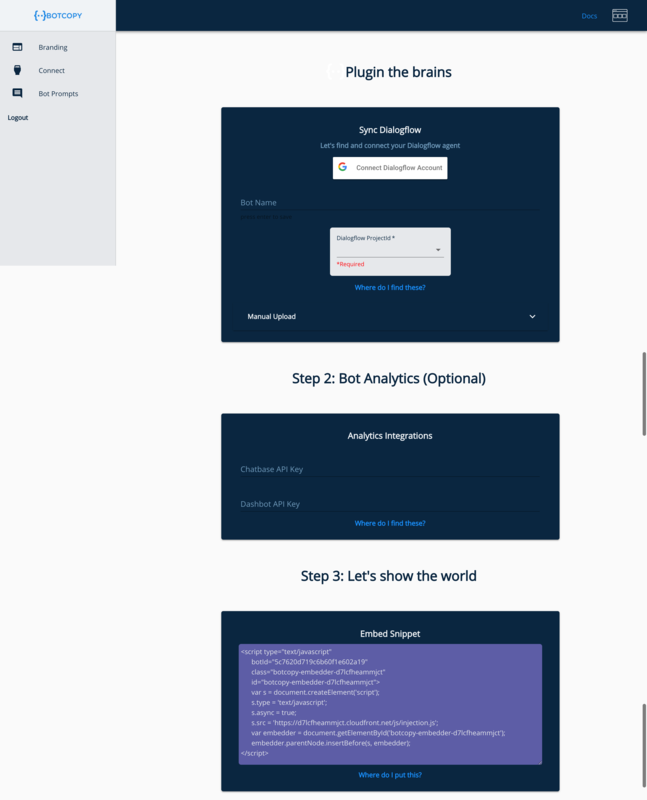 If you don't have a Dialogflow agent you can still try out the branding portal. We'll generate a random name for your bot. To change the name click on the bot, then find & click the Connect tab in the left sidebar. Within the Connect page you can rename your bot. Add your greeter or "bot prompt" image, and an avatar image for your web chat. Choose colors and fonts to fit your brand. 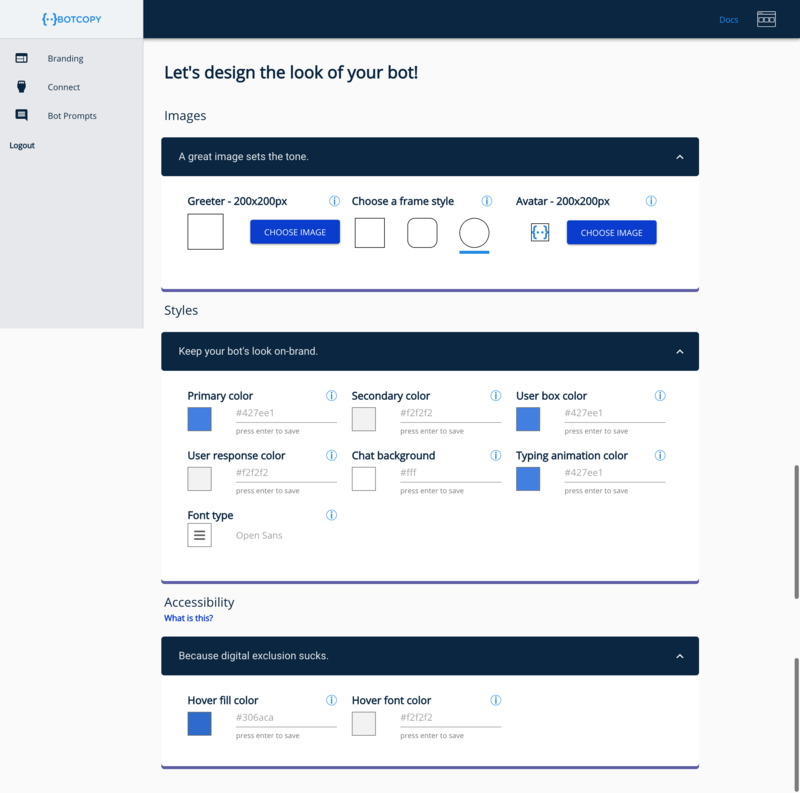 View your theme in real time and tweak till it's perfect. Botcopy's WCAG-compliance features ensure your design can be accessible to everyone. Tap the "Connect Dialogflow Account" button. In seconds, a dropdown menu will appear with all of your Dialogflow agents. Select the agent you want to connect to your Botcopy bot, and add your bot's name in the Name field. (Alternately you may connect manually by uploading a JSON file.) A snippet of code will generate at the bottom of the page. Copy and paste that code into your website and you're done! Customize the start of the conversation with every page on your site. 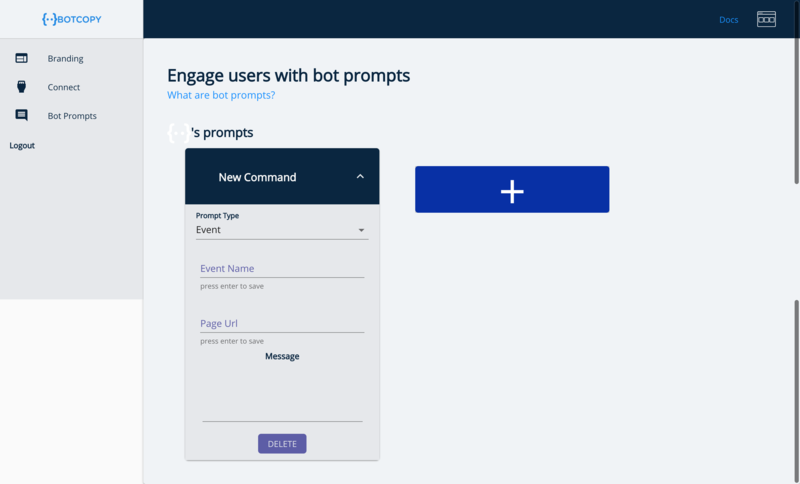 Bot prompts are pulled by creating events or training phrases in Dialogflow. New bot prompt triggers coming soon! 6) Done! 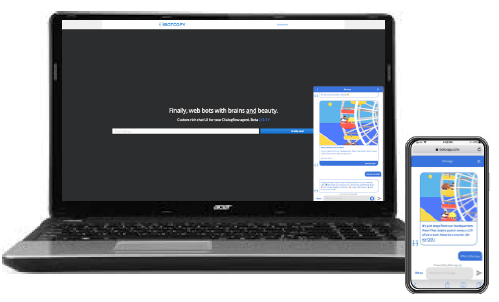 AI-powered web chat that looks great on mobile & desktop. Test your web chat bot on multiple platforms. Valued website visitors can now interface with your business via conversation. What will you automate? Sky's the limit! Train your bot on Dialogflow and keep an eye out for Botcopy's new features! Test your web chat bot on multiple platforms. Valued website visitors can now interface with your business via conversation. What will you automate? Sky's the limit. Train your bot on Dialogflow and keep an eye out for Botcopy's new features! We're located in Santa Monica, California.